Rip DVD movie to MP4, MKV, AVI, MOV, WMV, WTV, WebM, FLV, etc. Extract background music from DVD disc to MP3, ALAC, FLAC, M4A, etc. 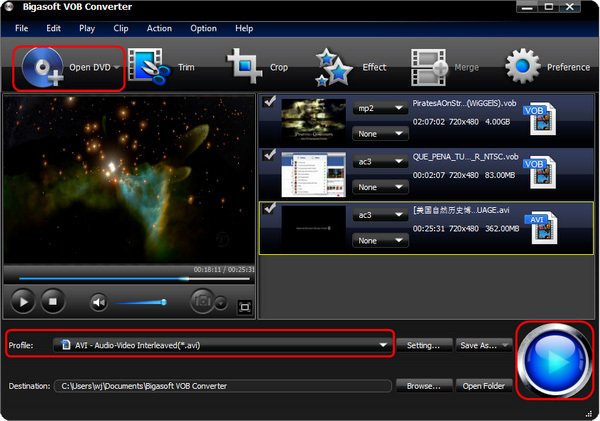 Merge DVD chapters, VOB files to get the whole movie played on any player and media device. Easy to choose and keep your desired audio track and subtitle track. Trim, cut, split, crop DVD VOB videos or add special effects, watermark easily. The following is a step by step guide on how to merge DVD VOB videos and save it to an entire movie. 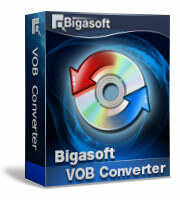 Firstly, download and install Bigasoft VOB Converter. Choose the right version to download, Mac version (Mac OS X 10.5-10.11) or Windows version (Windows Vista/7/8/10). Click "File" and select "Open DVD Folder" to load the Video_TS folder which you want to convert. And all the VOB files will be imported and listed on the main interface. Check all items and click Merge button on the top or just click "Ctrl + A" (Select All) and use "Ctrl + M" to merge the videos. The merged VOB movie file will also be automatically listed with the name like "Merge 1". Click Profile drop-down menu to choose your desired output format. MP4 are recommended for Mac fans and WMV or WTV is preferred for Windows users. Other more than 100 formats are supported and if you want to import DVD movie to iOS devices, choose desired output video format from preset iPad, iPod, iPhone (including iPhone 6 and iPhone 6 Plus) category. Click "Convert" button to finish merging and converting all the VOB files in Video_TS. When the conversion is done, you will be able to enjoy the whole movie without adding several parts one by one to your player. Bigasoft VOB Converter even features advanced edition functions like trim, add or remove subtitle, audio track and crop the picture. Download and enjoy the VOB Merger.